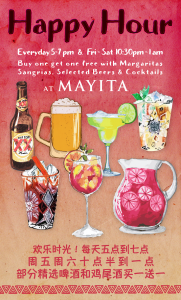 Everyday from 5-7pm, MAYITA will be offering a great late happy hour deal on most drinks. Buy 1 get 1 free for most cocktails and selected beers and great deals on craft beers and buy 2 get 1 free on pitchers of some of the best Margaritas & Sangria in town. An ever rotating cocktail list is on offer.